~Soap Paradise~: Our Favourite Rose is back! 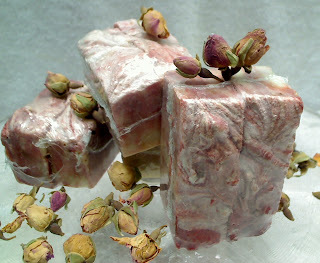 We have made two versions of Rose Soap. The Tea Rose has ground Morrocan Rose Buds infused in sunflower oil with ground Morrocan Rose Buds. This has definitely intensify the scent. Sunflower oil is great for moisturing and also helps with people who suffers with acne. Ingredients: Infused Moroccan Rosebuds in Sunflower oil, Palm oil, Coconut Oil, Cocoa butter, Infused rose water, Sodium Hydroxide, salt, ground Morrocan Rose Petals, Mica, Fragrace oil and Rose Geranium.